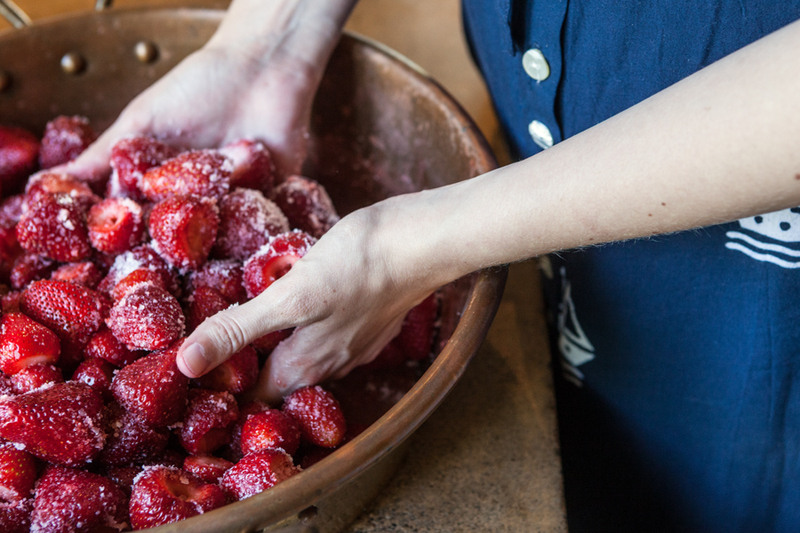 Late-season strawberries are almost upon us, and there’s no better way to capture their tender sweetness than with a macerated jam. 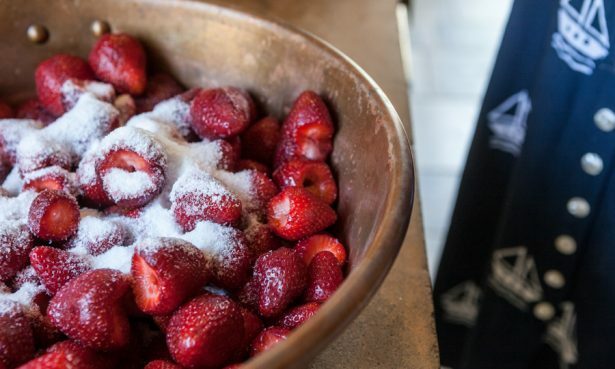 This technique, adapted from Joyce Goldstein’s new book Jam Session, separates the strawberries from their juices partway through the cooking process. This allows the berries to retain more of their fresh character than they would in a long-cooked preserve. It contains a mix of ripe and underripe strawberries, as the latter provide natural pectin to help the jam set. If you can only find ripe berries, your jam will be looser. Everbearing strawberry plants bear multiple crops over the course of one season, starting in late spring and continuing into September or even October. Some popular everbearing varieties include Eversweet, Quinault, Seascape, Tribute, and Albion. Place a few ceramic plates in the freezer for testing the jam’s set. Rinse, dry, and hull strawberries. In a large preserving pot, gently combine the strawberries, sugar, and lemon juice and toss to mix. Set aside to macerate overnight. The next day, add scraped vanilla bean or extract, place over medium-high heat, and bring to a boil. Cook for 5 minutes, watching closely to ensure berries do not boil over. Remove pot from heat and let it sit, uncovered, for 1-2 hours. Sterilize jam jars by submerging them in boiling water for 10 minutes. Sterilize lids in a smaller pot of boiling water. Leave jars and lids in pots of hot water on the stove until ready to use. 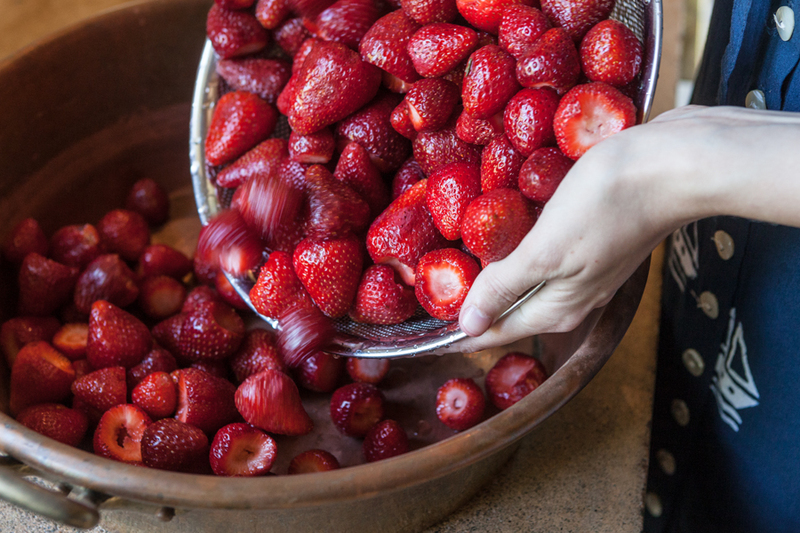 Bring strawberry mixture to a boil again over medium-high heat and cook for 3-5 minutes, until berries are tender. Strain strawberries through a colander, reserving juices. Return the juices to the preserving pot and add lemon juice to taste, plus a pinch of salt. Reduce syrup over medium-low heat, stirring frequently, until thickened. Slightly mash the strawberries and return to the pot. While stirring, bring to a boil and cook the jam briefly. To test if preserves are adequately set, drop a spoonful of hot preserves onto a frozen plate and turn the plate vertically for a second or two. If the preserve is finished, the jam will run very slowly, if at all. To double-check, run your finger through the dollop—if the jam wrinkles, it is set. Remove the pot from the heat, and remove vanilla bean, if using. Bring the water baths back to a boil, and place a baking sheet near your stove. Prepare a ladle, a jam funnel, if using, a wet kitchen cloth to clean jar rims, and clean cloths to protect hands from heat. Using tongs, place jars on the baking sheet. Ladle jam into jars, leaving 1/4″ clearance. Wipe rims clean and set the lids on the mouths of the jars. Twist on the rings. Using a jar lifter or tongs, gently lower jars into the water bath. Return water to a boil, then decrease to an active simmer and let jars simmer for 10 minutes. Turn off the heat and leave jars in water for a minute or two. Transfer jars out of the pot with tongs and leave at room temperature for 6 hours. Check to make sure that lids are depressed in the center. Any improperly sealed jars will keep in the refrigerator for up to three months. Sealed jam will keep for up to two years. This entry was posted in Eat Good Food, Preserve the Season and tagged berries, cooking, produce, summer.